And this is where the “if you’re like me” thing breaks down because at this point I’m sure you went about doing your Sunday laundry or working out in the basement or watching your Tivo’ed Lost episodes and just geenrally doing what normal people do on the weekends, which is not plotting to pore over media guides and empirically test the “Year of the Tiger” effect on Auburn’s athletic fortunes. Football: You probably remember that this season doesn’t much for our hypothesis. Terry Bowden was fired mid-year as Auburn went a miserable 3-8 overall and 1-7 in the SEC, the worst single season for Tiger football of my lifetime. Off to a bad start. Men’s basketball: Cliff Ellis earned his first postseason berth as a 16-14 (7-9) Auburn squad snuck into the NIT despite losing their opening game of the SEC Tournament to Florida. The core of the ’98-’99 SEC champions (Pohlman, N’Diaye, Robinson, etc.) beat Southern Miss in the first round before losing at Marquette in OT. Not great, but by Auburn hoop standards not bad, either. Baseball: Money. Auburn fell short of back-to-back College World Series trips, but still went 46-18, won the SEC Tournament, and advanced to the NCAA Atlantic II regional. Football: A stunning late loss to Florida in Gainesville (and the infamous “Nothing Stinks Like a Wet Dawg” game) helped derail what looked like a potential SEC championship season, but Dye’s Tigers still finished 10-2 overall and 6th in the final AP poll after a 16-7 strangling of Southern Cal in the Citrus Bowl. If this wasn’t the mid-80s, this would be a smashing success of a season. Basketball: Only a first-round loss to Miss. St. in the SEC tourney mars arguably the greatest season in Auburn men’s basketball history. Behind Chuck Person and Chris Morris, Sonny Smith goes 22-11 in the regular season and finishes 2nd in the SEC with a 13-5 mark. But that’s just prelude to No. 8 seeded Auburn’s best NCAA Tournament performance ever: a first-round win over Arizona, an 81-65 second-round thrashing of top-seeded St. John’s, a Sweet 16 upset of 11th-ranked UNLV, and finally a stout battle against eventual national champion Louisville in the Elite 8. Baseball: Hal Baird didn’t have everything up and running just yet, as the Tigers went 31-24, 15-12 SEC. They were ousted in two games in the SEC tourney and missed the postseason. Football: Coming off a disappointing 6-6 season, Shug Jordan’s Tigers open up 7-0 before finishing the regular season 9-2 after losses to Florida and Alabama. Auburn recovers to thump Texas 27-3 in the Gator Bowl, sealing a 10-win season and No.8 and No. 6 final rankings from the AP and UPI, respectively. Jordan’s last great season. Basketball: Oof: Bob Davis’s first team went 10-16 overall and 5-13 in the SEC. This still represented a four-game improvement in the overall record, which explains why Davis had taken over in the first place. Baseball: Coach Paul Nix has an outstanding year: the Tigers go 31-13 overall and post an 11-6 SEC record. Unfortunately, standards for postseason qualification are much tougher in those days and that’s as far as the Tigers cn go. Football: Ho-hum: Jordan takes Auburn to a respectable 6-3-1 mark, but the season ends with a 38-0 thumping from the Tide–the second straight year the Tigers have failed to even score a point on Alabama–and without a bowl appearance. Basketball: Two years removed from an SEC championship, Joel Eaves guides Auburn to an 18-6 overall record and an 11-3 mark in the SEC, good enough for third in the league standings. Back then, even that wasn’t enough to get a postseason sniff, but this still goes down as an excellent season for Auburn hoops. Baseball: In his final season as Auburn head coach, Erk Russell–yes, that Erk Russell–takes the Tigers to a 15-7, 11-5 season that appears to be par for the course at the time. He would leave for Georgia’s football staff in the offseason and Nix would take the team to an SEC title and NCAA Tournament berth the very next season. Football: I’d rather skip it. Earl Brown goes 0-10, the last Auburn winless Auburn season on the books and probably the last one forever. Jordan replaces him the following season. Basketball: Eaves proves his mettle in his very first year on the job, going 17-7, 12-6, and placing third in the SEC. Dunny Doyle had gone just 9-15 the year before. Baseball: In only the second year of the program’s existence, Jonny Williamson brings Auburn within a game of .500 at 12-13 overall, 8-11 SEC. Not stellar, but an improvement on the team’s inaugural season. Basketball: Fella by the name of Ralph Jordan takes Auburn to a 4th-place finish in the SEC with a 14-5 overall mark and 6-3 league record. It’s Jordan’s winningest season yet after five years on the job. Football: Dave Morey goes 5-4. Nothing too exciting. Basketball: Mike Papke finishes 5-10 his first season. Football: Look out: Mike Donahue goes 8-0-1, extending Auburn’s unbeaten streak to 17 games after a perfect 1913 season. The streak would hit 23 before Vandy snaps it in late 1915. Basketball: Donahue doesn’t have as much luck on the hardwood, going 3-10. Football: R.S. Kent and Mike Harvey combine to go 2-4-1 in their only season of head coaching duties. No basketball program yet. The “Year of the Tiger” has produced some terrific seasons that far outpaced general program standards … but also some awful years, particularly in football, that also fell far, far below them. 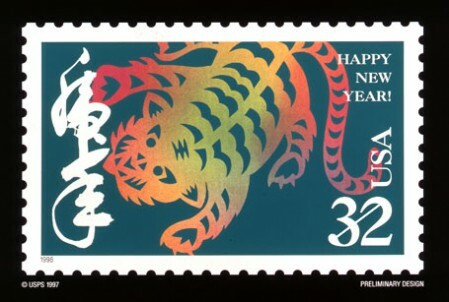 Overall, this could very well be the Year of the Tiger … but I’m not going to trust it to be written in the Chinese stars. As a Georgia Southern fan (and current grad student) who has always followed the story of Erk Russell due to his time as head coach here at GSU (then GSC) and because he was an Auburn Tiger, I honestly did not know that he was the head coach of Auburn’s baseball team. Another thing to add to Erk’s legacy. But apparently he played baseball as well as THREE other sports at Auburn, the last Auburn athlete to earn varsity letters in four sports. Hell of a guy. At first I was wondering why you had a question mark at the end of the title. But ouch. Just one SEC title, combined? I found this interesting tonight in class. We have a Taiwainese woman in our class, and she was born in the “year of the tiger”. However, that year ‘(every 12th) is supposed to be bad luck for that person. Let’s hope its not the case with us, but I thought I’d pass it along. A homeless man in Orlando told me at 12am New Years Day that this would be our year. MarkG, good to hear. Unless every classical myth I’ve ever read is wrong, the crazy raggedy people are the ones who have the best idea of the future. I’m working on a thesis on Auburn baseball and couldn’t help but notice the lack of baseball in the bottom half of the post. The media guide has always sucked for baseball. Auburn has been playing baseball at least since 1895 . API played ball in the SEC starting in 1933. 1938 record 15-12 3rd in SEC by my count without Billy Hitchcock (knee injury). 1926 record – 19-6 which included wins against minor league teams. 1914, 1902 I don’t have on hand. Worth noting is that when the football team didn’t play Bama the baseball team didn’t play Bama either.